This article organizes known issues about Small Basic v1.0. These issues happen both in local (under IDE environment) and remote (under smallbasic.com with web browser and Silverlight). Differences between in local and remote are listed here. Various Math object errors cause unhandled exceptions. See ZXF613 and MVJ631. Needs better error handling. GraphicsWindow.GetPixel doesn't work for background layer. See MXG391. Shapes.AddText() at the top of program shows exception thrown by target. MDI children can be resized such that their "Close" button cannot be clicked (details). Click and drag the top edge (or a top corner) of an editor MDI window with your mouse. Drag it up, over the menu of the SB IDE to resize the MDI window. Then you can't move or close the MDI window anymore. Need to re-triage, based on repro steps. STATUS: Can't fix; As Designed per Windows API. Limitation is related to Bug #8. When GW.canResize = "False", NO MINIMIZE BUTTON (See CPT410). UPDATED INFO: See sample program FKJ066. In Windows 8.1, values GW.Width and GW.Height are changed after changing GW.CanResize. Also values GW.Top and GW.Left are kept but the GW position is changed after changing GW.CanResize. In old Windows, window frame width has been changed when resizing was inhibited. This problems may come from Windows behaviour. Snipping Tool seems to check whether the window can resize or not for [Window Snip] in [New] menu. Non resizable window is snipped smaller by Snipping Tool in Windows 8.1 (same in Windows Vista). But by Alt+[Print Screen] and paste to Paint, we can get the whole non-resizable window. STATUS: Can't fix. This is a Windows limitation. If you disable Resize, then you disable Min/Max. Source. Need to test on Windows 10. A dependent GW.Width & GW.Height is made incorrect by GW.CanResize (by Jibba Jabba). UPDATED INFO: See info for #8. STATUS: Can't fix. This is a Windows limitation. If you disable Resize, then you disable Min/Max. Source. The remote/online environment does not have parity with the local run-time environment. See Small Basic: Difference Between Local and Remote. UPDATED INFO: The sample XDX644 may have a bug in line 14. Shapes.Move(sth,x,y) may not be needed. This bug was reported by ProfessionalOfSmallBasic. The status from the Small Basic Community Council is currently CAN NOT REPRO. STATUS: Can't Repro. Fixed for 1.2. Dictionary object sometimes doesn't work from June 2014 (detail). GraphicsWindow.GetPixel crashes if coordinates are outside window e.g. x < 0. Hiding and showing a TextWindow crashes 8.1 and deletes content in Windows 7 (details). A shape moving over a stationary mouse causes MouseMove event. This issue occurs only in local. See GSX344. UPDATED INFO: Fixing this issue has two complications. One is that compatibility for the current program will be lost (all previous programs built with it won't work; they'd have to be re-written). Another one is that collision detection between Shapes may become complicated. STATUS: In Review. Big impact in breaking programs if this gets fixed. 2. Click [Adjust screen resolution] in [Appearance and Personalization]. 3. Click [Make text and other items larger on smaller]. 4. Check [Let me choose one scaling level for all my displays]. 5. Select [Medium - 125%]. 7. Sign out then Sign in. STATUS: In Review. Need to test on Windows 10. The Small Basic environment hangs up (shows "Not Responding") when pushing arrow keys while text finding. This issue occurs often while in coding. Find some text and move your cursor with the arrow keys to change something. The IDE hangs up and can't recover the edited source code... Workarounds: (1) Save before you use "Find" or (2) Wait until "Find" is done completely before pressing keys. - After that, repeat find string "endif" with F3 and hit down arrow key. STATUS: Fixed for 1.1. Can't repro in 1.1. Small Basic incorrectly handles divide-by-zero (produces the result 0 instead of an error). STATUS: Can't Fix due to platform limitations. Shapes.Add creates screen flicker. Limits some programs to a "tinnie" finish. Details. Strings without a closing double-quote character (when stored in a variable) are accepted as being valid. Details. Graduate causes an error with latest Visual Studio 2013. STATUS: can't be reproduced now. Once experienced both in VS 2013+Windows 10+SB 1.0 and VS 2013+Windows 10+SB 1.2. But now in Windows 10+VS Community 2013 (reinstalled)+SB 1.2 it doesn't show the error (VB was not found) above. IME (Input Method Editor) sometimes be disabled in the IDE editor. Details. The cursor (caret) in the IDE editor sometimes doesn't move correctly in programs that have double byte characters. Decimal + "" becomes 0 when the decimal has a decimal point set as "," in Control Panel. This issue still remains from SB 1.0 to SB 1.3. Details. Turtle.MoveTo operations sometimes cause error with decimal fraction coordinates. Details. Description about return values for File.GetDirectories and File.GetFiles are wrong (SUCCESS) in some localized versions such as Arabic, Italian, and Japanese. Need language specifics for Arabic and Italian. STATUS: Languages are being reviewed individually by file. Japanese Fixed for 1.2. There are incorrect sentences in the description of TextWindow.Write() . Correct: Help in IDE, doc.smallbasic.com . Incorrect: smallbasic.com/doc.aspx . STATUS: TechNet Wiki Reference Document is corrected. Need to update SmallBasic.com. Clarify Math.Floor and Math.Ceiling - presumably Math.Floor should specify it returns "the *largest* integer that is less than or equal to the argument" (i.e. returns the "rounded down" integer value). Currently it specifies it returns "an integer that is less than or equal to the argument", which implies it could be any integer smaller than the argument, not the next smallest integer. Similar for Math.Ceiling. SB.exe (SmallBasicLibrary*.xml - for all languages) should be fixed. STATUS: TechNet Wiki Reference Document is corrected. IDE fixed for v1.2. Description about stackName for each Stack.PushValue, Stack.GetCount and Stack.PopValue in French is wrong - "La valeur à empiler." The description should be "Le nom de la pile." French description of "GraphicsWindow.Top" is wrong - "Obtient ou définit la position droite de la fenêtre graphique.". Should be "Obtient ou définit la position du haut de la fenêtre graphique.". French description of "Text.GetSubTextToEnd()" is wrong - "Obtient une partie d'un texte en partant de la fin.". Should be "Obtient une partie d'un texte depuis une position donnée jusqu'à la fin du texte.". The description of Controls.Add*() methods (AddButton, AddTextBox, AddMultiLineTextBox) is wrong - ending by "... with the specified width and height.". Should be "... at the specified position.". It's wrong in english, french, español, so apparently it's wrong on all languages. Network object should not be a private helper but just a helper. Full spelling of an abbreviation MML is wrong in Sound.PlayMusic(). Music Markup Language is wrong. Music Macro Language is correct. smallbasic.com reference for Array class is outdated: The methods SetValue/GetValue/RemoveValue no longer exist in Small Basic. STATUS: TechNet Wiki Reference Document is corrected. IDE verified fixed for 1.0. Following translation to Japanese in Text.Append() is not correct: unknown text in variables. STATUS: Fixed for v 1.2. Following translation to Japanese in Math.Celling() is not correct: celling value. Following translation to Japanese in Math.Floor() is not correct: floor value. Following translation to Japanese in Math.Power() is not correct: Raises the baseNumber to the specified power. Following translation to Japanese in Math.Power() about baseNumber is not correct: The number to be raised to the exponent power. Following translation to Japanese in Math.Power() about exponent is not correct: The power to raise the base number. Following translation to Japanese in Math.Power() about Returns is not correct: The baseNumber raised to the specified exponent. There are redundant space characters before （ (full-width left paretheses) because there is no reason to insert a space between full-width characters in Japanese Style Guide. Between characters, a space should be inserted as follows. In principle, insert a half-width space. Following translation to Japanese in GraphicsWindow.Clear() should be corrected according to Microsoft Language Portal: Clear. Following translation to Japanese in SB.EXE about an argument error message of operation in object is not correct: Operation. Following translation to Japanese in SB.EXE about an operation name error message is not correct: operation. Following translation to Japanese in SB.EXE about an error message is not correct: is expected a return value, but it doesn't return anything. Following translation to Japanese in menu of SB.EXE should be corrected according to Microsoft Language Portal: Paste. Following translation to Japanese in menu of SB.EXE should be corrected according to Microsoft Language Portal: Undo. Following translation to Japanese in dialog for [Publish] of SB.EXE should be corrected according to Microsoft Language Portal: Sample. Especially this translation makes Japanese confused because Example is translated to 例 also. Sample and template code in IDE. Replace as well as Find (i.e Find and Replace). Code suggestions in IDE (a bit like grammar in Word). Provide methods for determining the type of a value stored in a Primitive. X.509 certificates for code signing and TLS. Something to limit or at least control of extensions - maliciosly used they can be extremely dangerous. Thinking something in IDE that can turn off extensions use or highlight code using extension objects. In-program language reference (i.e. search for function or reference outside of intellisense). Support plain PPM (Portable Pixmap) Image file. Collision detection for Shapes. Including images that have transparent bits. Code folding (perhaps as an advanced setting). Refactoring (maybe with right-click only). Video Enhancements - To allow quicker & more powerful video manipulation. Video Speed: It seems some of the existing video commands could do with speeding up, or alternative/faster versions added. Video Strength: A set of commands to increase the power of graphics/screen manipulation would be very useful. Allow a simple sound command to synthesize sound effects rather than play back .WAVs. Audio Versatility: A simple set of sound commands to allow programmers to create synthesized sounds rather than relying on using .WAVs. ie: Create a sound event (getting back an id), and declare its waveform, pitch, volume, duration, which you can then further modify/control using the sound's id. Ability to drag and drop controls like VB 1. Example: A simple hashtag that is searchable. Example: A list of "My IDs" that's saved locally and accessible. Example: A way a teacher can save/access all the students' IDs in the class. Add more controls: ProgressBar, CheckBox, ComboBox, ListBox, CheckedListBox. Add an OpenFileDialog(), SaveFileDialog, Font/ColorDialog. Add the potential of playing a video and controlling a video. Let us resize a shape precisely instead of zooming it since it creates a mesh when resizing a shape with Controls.SetSize(). To be able to create virtual (non-displayed) windows, and to be able to manipulate these. 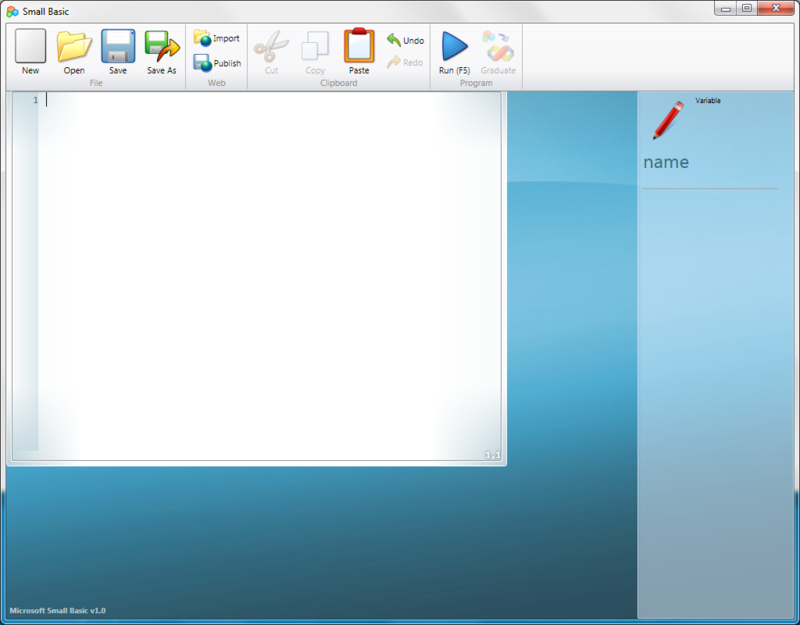 So you could define what your current working windows is (the displayed one or any of your virtual ones). A new ScreenRegionCopy method could then copy a region of any screen to any screen (virtual or displayed). This would, (a) allow screen region scrolling, and (b) allow a whole new screen to be created on a non-displayed screen, before it was then copied to the current screen. This would prevent flicker. Being able to copy a region of a screen into an image to then be manipulated (rotated/resized). Then to allow sprites to be created along these lines too. Is there going to be a version 1.1?